Click on any city to find a beach rental and coast vacation rentals for that city. You will find listings for Oregon State cabin rentals and beach rental condos. Oregon Coast vacation rentals are a great way to enjoy the beauty and have a spectacular vacation. 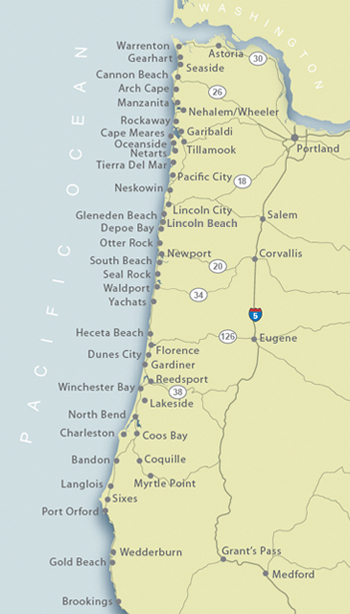 The Oregon coastal area has numerous light houses that you can tour. Regularly scheduled tours are offered at the Cape Blanco, Heceta Head, Umpqua River, Yaquina Bay and Yaquina Head lighthouses. The Cape Meares and Coquille River lighthouses have public exhibit areas. Between Coos Bay and Port Orford, OR, a unique climate area exists for plants and trees. The Port Orford Cedar tree, Oregon Myrtle and the Western Azalea are found here.